The commercial center of Southeast Asia, this island city-state of five million people is a metropolis of modern high-rises, Chinese shop-houses with red-tiled roofs, Victorian architecture, Buddhist temples and Arab bazaars. It is a melting pot of people and cultures -- Malay, Chinese, English and Tamil are official languages; Buddhism, Taoism, Islam, Hinduism and Christianity are the major faiths. 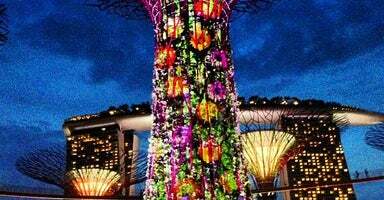 Ever fascinating, Singapore boasts diverse cultures, luxurious hotels, and some of the finest duty-free shopping in the world. The second-highest point in Singapore offers panoramic views of the harbor, Sentosa Island and the downtown district. Explore this district filled with a myriad of colorful spice shops, clothiers, and Indian flower garlands. Feast your eyes on the oldest Chinese temple in Singapore and the island's most important Hokkien temple.